Keep 8 mm safety margin from the binding edge. Please note: Calendars do not come with a preset month and date design, this needs to be included in the submitted artwork. Keep all important text and images at least 8 mm away from the binding edge. A wall calendar is a bundling of papers with usefull calendar information and your own beautfifull design and company information. The calendar is binded on top with a wire-o binding. It is a way to really impress your (new) customers! For the delivery of your wall calendars design we use multiple carriers. Because of the highest reliability, in most cases we use UPS or DPD. The wall calendars design that is chosen in most cases can be selected via our website. 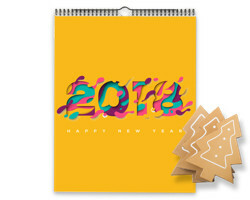 How do I supply my design file for Wall Calendars Design? Please supply all pages seperately, but in 1 PDF-file. If you sequence the pages in the way you want them, nothing can go wrong. We can not proceed with spreads (pages next to eachother) or multiple PDFs. How do I hang up my wall calendar? The wall calendars have a wire-o on top with rings. On top there is a hook.